The Catnip Diaries is a fictional collection of reflections on a cat’s first year with its owner, presented in the voice of a cat named Sparkles, with some italic interjections from the owner. The story is based on the author’s experiences adopting her own Sparkles after her husband moved to a nursing home. It begins on the cat’s adoption day from the shelter and continues with amusing experiences as he adjusts to his new life and home. We chuckle at Sparkles’ nighttime attempt to stop his owner from snoring and later when his owner takes a host of pictures of him and the repeated camera flash makes him woozy. His antics with a daddy long legs also prove amusing. Occasional references to the owner’s spouse, now in a nursing home (echoes of author Eileen Novotny’s real life), hint at the important role this cat holds for his owner. But such sober glimpses are rare; overall, the narrative remains upbeat, seeking to entertain and amuse. The book concludes with the human owner’s reflection upon this first year together. 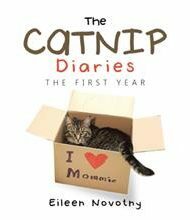 The writing style in The Catnip Diaries is light and breezy, with entries generally kept to one or two pages. Some elements can be distracting: While most observations seem appropriate to a cat, for instance, some are a stretch (as when Sparkles gets “fixed” and understands the concept of pain meds or when he talks about a “pretty looking decanter”). And the excessive use of the term “Mommie” feels human-imposed, rather than convincing. With more than 300 entries, the book might run out of charm for some over the course of the narrative. And more photos would have been welcome (we don’t see what Sparkles looks like until page 39). But overall, this is a fun look into what the feline mind may hold and makes for an easy, smile-invoking read. It could serve as a welcome gift for a cat lover friend or a favorite vet’s office.